With the third installment in Sam Raimi’s hugely popular Spider-Man series, one gets the sense that the franchise has either started to outstay its welcome, or needs to change some things for a possible fourth episode. Spider-Man 3 isn’t unwatchable (although a couple individual scenes nearly are), but it’s a marked step down from both the first and second movie. When the movie starts, not long after the events of the last film, things are looking like they’ve finally come together both for Peter Parker (Tobey Maguire) and his Spider-Man alter ego. Peter is finally dating Mary Jane (Kirsten Dunst), to whom he plans to propose, and Spider-Man has become a New York icon, with the masked protector even being thrown a lavish parade where he receives the keys to the city after rescuing Gwen Stacy (Bryce Dallas Howard), a classmate of Peter and the daughter of the police chief (James Cromwell), during a crane accident. But as ever, trouble is brewing. Peter and Mary Jane’s brief bliss hits a rough patch when her own flagging Broadway career leads to jealousy of his newfound fame, which in turn is going to his head and causing him to brush off her own problems, and he has three dangerous new adversaries to contend with. First is Peter’s old friend Harry Osborn (James Franco), who has discovered his father’s (Willem Dafoe) weapons and glider and wastes no time putting them to use in his obsession to destroy Spider-Man. Next is Flint Marko (Thomas Haden Church), a thief linked to the murder of Uncle Ben (Cliff Robertson), whose accident in a molecular testing site transforms him into the powerful Sandman. And finally there is the arrival of the parasitic alien Venom, which bonds first with Peter, unlocking heightened aggression, and later with Eddie Brock (Topher Grace), a rival photographer with a grudge against Parker. Probably the biggest of Spider-Man 3‘s problems- and there are several- is that it has too much going on at once. Between the ever-complicated relationship of Peter and Mary Jane, the culmination of Peter’s enmity with Harry, and his battles with Sandman and Venom, there’s a lot going on all the time here. The movie can’t seem to make up its mind whether it wants to be about Peter joining the dark side, Peter vs. Harry, Peter vs. Sandman, or Peter vs. Venom, and the result is that all these subplots (except perhaps Peter vs. Harry) seems half-baked. In all fairness to Sam Raimi, he had not intended to include the character of Venom, which was essentially forced on him by producer Avi Arad. The villain has all the trademarks of being awkwardly shoehorned into a movie that should have been about Peter, Harry, and Sandman. Eddie Brock is not sufficiently developed, and his monstrous alter ego is treated as an afterthought tacked on without enthusiasm or any real interest by Raimi because the purse-holders pushed it on him. Venom only makes his full-fledged appearance in the final twenty minutes or so, is never properly explained, and is never so much as referred to by name. Fans of the character will not be pleased. Other characters are shortchanged as well. What elevated Spider-Man 2 above a run-of-the-mill special effects-heavy action-adventure was that genuine time and attention was devoted to the relationship between Peter and Mary Jane. This was given at least as much focus as the action sequences, handled with a degree of sensitivity, and provided the heart for both of the previous installments. Here, while there is a certain satisfaction in finally seeing them together a semi-normal couple, the filmmakers resort to throwing in complications that seem contrived (her failing career versus Peter’s icon status making her jealous and inflating his ego is soap opera level relationship complications 101 type stuff). I also disliked the ‘revelation’ that Marko is Uncle Ben’s ‘real’ killer. It cheapens the tragedy in the first film and seems like the kind of lame retroactive plot twist writers resort to when they’re running out of ideas. There’s another contrivance too lame to forgive involving Harry’s butler, who suddenly knows everything at a convenient moment. Brock/Venom is also not the only extraneous supporting character. A platinum blond Bryce Dallas Howard, who gave a nice leading turn in The Village, is wasted as Gwen Stacy, who seems randomly thrown in more as a nod to the comics than an actual relevance to the story. James Cromwell is even more wasted as her father, and Theresa Russell has only a cameo as Mrs. Marko. J.K. Simmons is still around as J. Jonah Jameson, but while he still has a couple amusing moments, the filmmakers have made an obvious and dubious deliberate move to restrain him. Compared to Spider-Man 2, where he was given free rein to sink his teeth in, Simmons seems practically muzzled. Of the other series veterans, Rosemary Harris drops in now and then to provide a few words of wisdom as Aunt May and Bruce Campbell has an extended cameo as an urbane French maitre’d. Like Simmons, Campbell’s inevitable cameo is one of the small pleasures we’ve come to look forward to. Dylan Baker has the same couple of scenes this time around as in the last movie (although his role of Dr. Curt Connors, who in the comics becomes the villain The Lizard, gives some fans hope that he might eventually play a bigger role if the series continues), while Cliff Robertson’s Uncle Ben and Willem Dafoe’s Dr. Osborn/Green Goblin again return from beyond the grave (Robertson in a flashback detailing his fateful encounter with Marko, and Dafoe exhorting his son to wreak vengeance on Parker). Lest my review sound overwhelmingly negative, Spider-Man 3 does have good qualities. The acting overall is fine, unsurprising considering the core cast of Maguire, Dunst, and Franco have now been in their roles for three movies. Maguire still has no problem with the role of geeky Peter, and Dunst doesn’t have anything that’s much of a stretch; this is the third film in a row where her role has consisted of being alternately besotted and frustrated with Peter and ending up as the damsel in distress dangling from the side of a building. James Franco, who was a little stiff in the first film, and brooded sulkily through the second, is best here. Not only has he loosened up significantly to make Harry the most genuinely likable he’s ever been, he’s also effective when Harry succumbs to his dark side. Like Franco, Thomas Haden Church crafts a sympathetic ‘villain’, bringing depth and feeling to Marko while at the same time looking like someone you wouldn’t want to tussle with. Marko/Sandman is the only of the newcomers to make any impression, and his first transformation is a marvelous special effect. 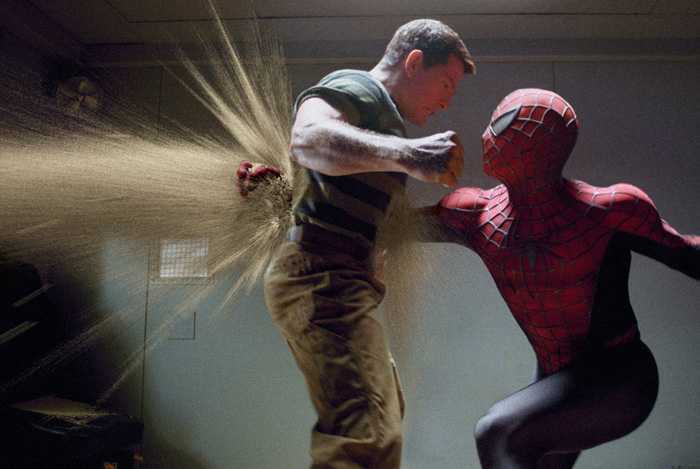 The special effects are impressive, but none of the action sequences equals the train fight in Spider-Man 2. The closest to its level is the first, as Harry makes his first attack on a plainclothes Peter and the two go on an extended, frantic chase through the streets and buildings of New York. Not only is the sequence kinetic and dizzyingly fast-paced, it’s a nice novelty to see Peter go through an entire fight scene as Peter Parker, not Spider-Man, and the fact that both Peter and Harry are unmasked adds something a little more intense and personal than when, say, Spider-Man battled The Green Goblin. A later knock-down drag-out fight between the two is also memorable, as the obsessively vengeful Harry and a symbiote-influenced Peter attack each other with equal ferocity. The Peter vs. Harry plotline leaves more of an impression than the one pitting Spider-Man against Sandman and Venom, partly because we have known Peter and Harry as friends-turned-enemies for three movies, and partly because three bad guys doesn’t give each a lot of individual attention. The first two movies had singular adversaries, Green Goblin and Doc Ock, and partly because they split screentime and focus between them, Sandman and Venom don’t end up being especially memorable. The climactic confrontation is the lamest third act of the series, partly because Topher Grace’s smarmy Eddie just seems like too much of a whiny brat to make an imposing adversary. Never does he seem a worthy opponent for Spider-Man, and his Venom alter ego is woefully underdeveloped. The last problem is that the movie engages in entirely too much silliness. None of the Spider-Man movies are meant to be taken terribly seriously, and they all have their intentional corny, self-mocking quotient, but Spider-Man 3 contains scenes that are far and away too silly even by the standards of the series. For all the hype about Spider-Man facing an inner struggle with his own dark side by bonding with the symbiote, the filmmakers’ idea of Peter descending into the dark side seems to consist of him dressing all in black with an emo haircut and strutting around snapping his fingers at every woman who crosses his path like John Travolta in Saturday Night Fever (later there’s even a strange little dance number that belongs among the deleted scenes). To say this is not exactly an in-depth portrayal of a superhero wrestling with his dark side is an understatement. This is not what fans had been led to expect from the trailers and promotions constantly speaking of ‘the dark side’ and inner struggles. Peter had more effective inner conflict in Spider-Man 2. Scattered throughout, there are effective scenes that seem in line with the rest of the series. Peter’s early obsession with finding Marko (keeping an eternal sleepless vigil next to the police scanner) does a better job of projecting his inner turmoil and hints of a darker, more vengeful and angry side than his over-the-top antics later. The scenes with Aunt May are as fine as ever, and early on Maguire still gets a few laughs out of what an awkward nerd Peter is. At the same time, his goofy nerdiness is part of what makes him endearing, and his crushed puppy expression in a scene on a bridge between Peter and Mary Jane reminds us that we still like and care about Peter Parker. The climactic battle is lame, but the denouement is almost moving enough to make up for it, and ends the movie on a poignant note. But we shouldn’t have to be sifting through to sort the effective moments out from the cringe-worthy ones. Spider-Man and Spider-Man 2 were breezy adventures that were fun and easy to sit through. Almost everything about Spider-Man 3 lacks the freshness of the earlier installments, and after enjoying 1 and 2, 3 feels like the one you watch obligatorily because you feel like you have to, not out of any great enthusiasm. Sony Pictures has already announced its intention to add more installments, but Sam Raimi and Tobey Maguire have been ambiguous about their willingness to commit (in my opinion, attempting to continue the series without the same cast and crew would be a mistake). In any case, if the filmmakers want Spider-Man to continue in this franchise, they need to step back and take a careful look at what made the first and second films work.